Laura Hoffman has been designing homes for over 20 years. She has worked on homes in various stages, and on many different budgets. She has been involved in the building process from initial plans, to picking out every hinge and doorknob, to remodeling, to just giving advice on paint colors for that special room in your home. Laura is well versed in all areas of design. Talk to any of her former clients, and they will tell you she’s able to connect on a personal level. She will take the time to listen to your thoughts and ideas. That connection helps her understand your style, bring your vision to life, and meet the needs of your family. CLICK HERE TO SEE LAURA'S DESIGN PROJECTS! Debbie Gray has a Bachelor’s Degree in Interior Design, and more than 30 years of design experience including everything from designing commercial and residential interiors, to creating showroom displays, to wholesale accessory and furniture buying, and everything in between! Drawing on her diverse design experience allows her to bring your project to life—from start to finish. Debbie’s loves the endless array of furniture and accessories that are available at Steinhafels. Debbie’s goal as your designer is to build a partnership allowing her to create an environment that is a reflection of you and your family, that compliments your lifestyle, and that highlights your design style. She will listen to your wants and needs, and finding the best way to incorporate them into your design plan. It's a busy world and there are a lot of demands on your time. Enjoy some free time while she handles the details! CLICK HERE TO SEE DEBBIE'S DESIGN PROJECTS! Joe Heins has been fulfilling dreams and working with clients - with hundreds of different visions, budgets, and design needs - for many years. Joe has perfected the art of listening to clients, and creating a personal connection with each and every one of them. He enjoys nothing more than seeing his clients smile when they see their finished projects. It would be Joe’s privilege to work with you on your vision, and to have the chance to create a stress-free process, where you allow him to take your vision and make it a reality. Joe hopes to share his time and talents with you and yours, and can’t wait to get started on the home of your dreams! Michelle Kahl has a degree in Interior Design from Madison College, and she likes to bring a fresh perspective to the latest trends and styles. Michelle is intrigued by every part of the design process--from selecting furniture and fabric, flooring, paint colors, window treatments and lighting... to creating floor plans and completing a space with accessories. The most important part of the design process for Michelle is listening. Listening to her clients’ wishes allows her to create a design that will not only suit their design style, but their lifestyle as well. Her goal is to create a stress-free and smooth process that in the end is going to save clients’ time and money. It is important to her to work within your preferred style, and create a one of a kind space that you are happy to call home! CLICK HERE TO MICHELLE'S DESIGN PROJECTS! Keri Russoniello grew up in New Jersey, her passion for design has it roots in Madison, where she visited during summer vacations. The charms, and quality lifesyles of this area sparked her love of creating beautiful homes to enrich the lives of individuals and families. The spark led to a 30 year career that has covered a wide spectrum of home design and decor - from hands on designing and fabricating of custom window treatments, to designing and coordinating the remake of entire living spaces. Keri has helped countless clients with design projects big and small. As a member of the Steinhafels team, Keri will carefully listen to your needs and desires, and always guide you to the best choices of color, fabrics, accessories, furniture, and spatial planning. The result - wonderful living spaces providing continuous enjoyment for you and your family! Dawn has been in the design business more than 20 years and she loves her job. She specializes in new construction and remodeling, and has done countless projects in both residential and commercial settings. Dawn really loves that Steinhafels has all the products she could possibly need to finish an interior design project - from furniture, to accessories, and everything in between! She loves when a customer says at the end of a project, "You really got me, you really got my style". 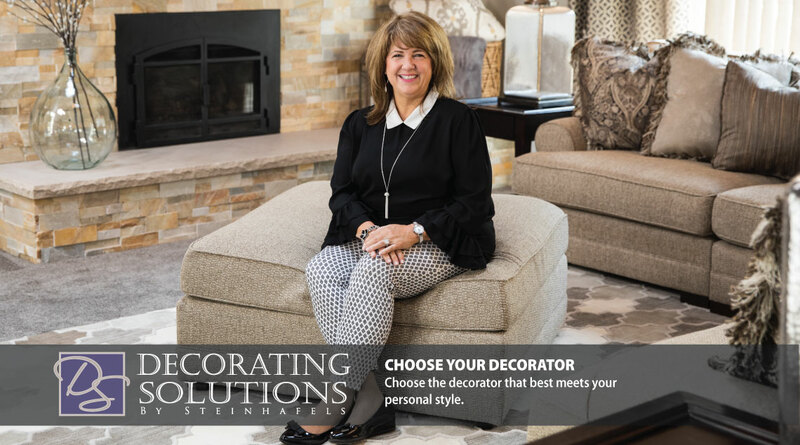 Dawn thinks that most important part of being a good interior designer is being a good listener, and finding out what a customer's needs and wants truly are. CLICK HERE TO SEE DAWN'S DESIGN PROJECTS! Devin Bagdassian has a Bachelor’s degree in Retail Merchandising and Management from the University of Wisconsin-Stout, and years of experience in textiles - from the corporate level, to store level, to design. Devin has always loved design and style and wants your design experience to be fun and enjoyable. She can help you create the home that everyone else wants! She’ll use your vision to design a house that's the talk of the neighborhood…a home where stress melts away, and a place where you can enjoy family and friends. CLICK HERE TO SEE DEVIN'S DESIGN PROJECTS! Lori Green has worked at Steinhafels for more than 21 years. Her design experience includes residential homes, commercial businesses, churches and schools, and senior living facilities. CLICK HERE TO SEE LORI'S DESIGN PROJECTS! Emily Lindsley is an interior designer with a Bachelor of Arts degree from UW-Green Bay, with a double major in Fine Arts & Design. For Emily, design is all about color, texture, and most importantly, balance, in order to achieve a clean and uncluttered look. Emily believes a home should be comfortable, a place where you can be yourself and unwind. It’s a place where you’ve created many memories, and also a place to entertain. As your designer, she will work to maintain your personality and help you make your home one you’re proud to show guests. She will use space planning to make sure your home functions in a way that makes your tasks as easy as possible. Emily will listen to your needs and ideas in order to interpret your style. Aaron Keller knows that decorating can be overwhelming at times. He wants to make the process fun and easy, and help you express yourself in your home. He has decorated hundreds of spaces ranging from traditional to transitional, to contemporary and rustic. CLICK HERE TO SEE AARON'S DESIGN PROJECTS! Jenii Kluver has a degree in Interior Design from Gateway Technical College. She has plenty of fresh, new ideas to turn your house into the home of your dreams! Jenii’s favorite part of designing is the look on clients’ faces when they see the finished product. Her favorite style is rustic mixed with traditional. She loves reclaimed woods and distressed finishes mixed with nailhead trim and clean lines. Jenii’s specialty is space planning. If you have a tricky space with obstacles, or not much space at all, she’s the designer for you! Whether you want comfortable and functional, or stylish and ornate, you will enjoy the stress-free process of working with a Steinhafels’ “Decorating Solutions” Interior Designer. CLICK HERE TO SEE JENII'S DESIGN PROJECTS! John Newell has twenty years of design experience to draw from to help you create the beautiful, functional home of your dreams. When beginning any large or small design project, John feels the biggest hurdle to overcome is developing a plan of attack. As your designer, he will listen to your ideas, and work with you to define how you would like to use the space you want to create. Keeping that in mind, he can help you make proper color, layout, and furniture selections to uniquely furnish the space to fit your personal needs. Designing your space is not an obstacle you need to tackle on your own. Let John help, and collaborate with you to find exactly what you're REALLY looking for in that room. Linda Patti has been with Steinhafels for more than 24 years, and has decorated more than 700 homes. From modest condos to mansions in Lake Country, she has done it all! Linda has also been featured multiple times in Parade of Homes, and has worked on new construction projects. Linda has designed and decorated corporate reception areas, offices, and conference rooms ranging from doctors and lawyers, to restaurants and bars, and even retirement homes. She hopes you choose her for her expertise and experience. Linda’s goal is to see the smile on a client’s face after a job well done. CLICK HERE TO SEE LINDA'S DESIGN PROJECTS! Colleen Rome has been designing for 15 years, and specializes in bringing color and vibrancy to a home that is victim to white walls. Colleen explains, “A lot of times customers will come in and just purchase a sofa and loveseat, only to get it home and realize there is something missing, and everything else in the room looks very blah!” Colleen loves mixing different styles together to create a fun eclectic mix. No project is too big or too small! Julie Thompson has been a designer for more than 25 years, including 10 years as an Interior Design instructor at WCTC. She has a Bachelor’s Degree in Interior Design, and has been featured in various publications. She has the ability to understand both her client‘s needs and wishes. Some of Julie’s favorite rooms start with a special piece that means something to the homeowner. She can then help create a whole new room design around that one piece! She loves that interior design is ever-changing. A designer must stay within the elements of design, but is not limited to color, style, scale, and balance. She looks forward to meeting you and creating beautiful designs together! CLICK HERE TO SEE JULIE'S DESIGN PROJECTS! Amanda has a degree in Fine Art, and 2 years of study in Architecture from UW-Milwaukee. Amanda knows creating a beautiful space can be difficult and daunting! With her background in Fine Art and Architecture, she can work with color, form, textiles and textures to transform your space into a functional - yet aesthetically pleasing - comfortable place to call home. Understanding your personality and how you utilize your space is essential to creating a cohesive floor plan, as well as designing custom pieces to fit your lifestyle. Whether you are in the midst of new construction, are doing a remodel, or just want to freshen up your space - Amanda can help with hundreds of options from flooring and paint, to furniture, drapes, and accessories. Amanda will listen to your ideas and translate them into your own personalized space. Contact her today, so she can help you create the home of your dreams! Jim Mallon is proud to be a decorator with Decorating Solutions. His professional design background is in Architecture. Early in his career, he worked for architectural firms and developers. As the housing boom began in the late 80’s, he accepted a position with a national award-winning residential architectural design firm. CLICK HERE TO SEE JIM'S DESIGN PROJECTS!